As previously promised we now offer the second posting regarding the Steelers' special teams. Specifically we turn our attention to the kick and punt return units; and it should come as no surprise to anyone that the numbers for those two units are exceedingly poor. Season Team Kick Return Avg. If there is any consolation to be taken from this is that winning the Super Bowl does not appear to be directly tied to performance in kick returns. 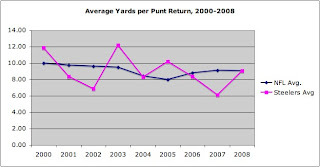 However, there is no arguing with the fact that every yard gained on a kick return is one fewer yard the offense needs. By that logic the Steelers are making things tough on their offense. As frustrating as the punt return team was in 2008 ("get up the field Santonio!") their performance was nearly three yards better than in 2007 (6.1. yards), and at least began approaching the excellent performance turned in by Antwaan Randle-El and his compatriots in 2005 (10.2 yards per return). In the overall scheme of things the Pittsburgh special teams showed marked improvement in 2008, at least compared with the 2007 season. However, as with most aspects of football, there is still tremendous opportunity for improvement.